Born in Dzerjinsk (Russia, Nijny Novgorod region) in 1988 in a family of professional musicians. From 1995 to 2003 he studied music at the Nijny Novgorod Choral College (including conducting with prof. M.A.Samorukova). From 2003 to 2006 he studied piano (with prof. V.G.Starynin) and conducting (with prof. A.M.Skulsky) at the Balakirev State Music College in Nijny Novgorod. From 2006 till now he studies orchestra conducting with prof. Gennady Rojdestvensky at the Symphonic Orchestra Conducting Department of the Moscow State Conservatoire; also, he studies playing historical keyboard instruments (harpsichord and hammerklavier) with prof. Maria Uspenskaya. From 2008 he studies Renaissance/baroque cornetto playing, and performs with the Moscow “Alta Capella” ensemble. Prize-winner of different competitions and festivals, including the 2001 Moscow all-Russian competition of young composers “Crystal Tuning-Fork”, The First International Volkonsky Harpsichord Competition (Moscow, 2010, Third prize), Musica Antiqua Harpsichord Competition (Bruges, 2010, Second Prize and Prize of the audience). Winner of grants and scholarships: The “New Names” charity fund in 2000 – 2005; the Rostropovich Fund; the Spivakov Fund. 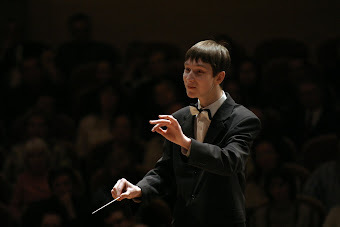 As orchestra conductor, he has made several performances with various orchestras, including the Chamber Orchestra of the Chuvash Republic, The Nijny Novgorod Soloists, Arpeggione Orchestra (Moscow), Sinfonietta Sophia, Academic Symphony Orchestra of the Nijny Novgorod Philharmonics, Helikon-Opera Moscow, Chamber Orchestra of Russia, "Musica Viva" Chamber Orchestra. Follows practical training as orchestra conductor with the Povoljye Youth Philharmonic Orchestra and with the Russian National Philharmonic Orchestra. The creator and the conductor of the Youth Chamber Orchestra "Veritas". Also, is active in making orchestration and re-arrangements of scores for various types of ensembles and orchestra.